Devotion is a category of expression in many of the world's religious traditions. This book looks at issues involved in academically interpreting religious devotion, as well as exploring the interpretations of religious devotion made by a sixth century poet, a twelfth century biographer, and present-day festival publics. The book focuses on the female poet-saint Karaikkal Ammaiyar, whose poetry is devotional in nature. 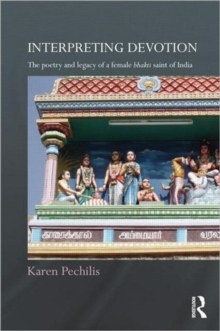 It discusses the biography written on the poet six centuries after her lifetime, and suggests ways of interpreting Karaikkal Ammaiyar's poetry without using the categories and events promoted by her biographer, in order to engage her own thoughts as they are communicated through the poetry attributed to her. In the same way that the biographer made the poet `speak' to his present day, the book looks at how festivals held today make both the poetry and the biography relevant to the present day. By discussing how poetry, story and festival provide distinctive yet overlapping interpretations of the saint, this book reveals the selections and priorities of interpreters in the making of a living tradition. It is an accessible contribution to students and scholars of religion, Indian history and women's studies.